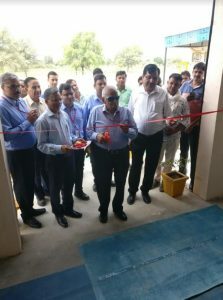 NEW DELHI: Merino Panel Products Ltd. (MPPL) turned on the power from a 5.5 MegaWatt Captive Open Access Solar Power Plant in the Hisar district of Haryana. The plant was inaugurated by Group ChairmanC. L. Lohia. Commissioned by Sunsure Energy, this is the first Captive Solar Power plant in Haryana to deliver power under the Open Access mechanism. MPPL will draw more than 9 million units (kWh) of electricity from this plant every year for consumption in its manufacturing unit in Bahadurgarh, Haryana. Not only is this plant first of its kind in terms of the power delivery model, it is also the first to use single-axis tracking at this scale (5.5 MW) in the State of Haryana. This design enables the plant to deliver up to 15% more energy than the more common fixed-tilt plants. In a recent order, Haryana Electricity Regulatory Commission (HERC) has waived all transmission and distribution charges on Solar Open Access plants, thus, making this a very well timed investment for MPPL. “In the Merino Group, we are now drawing from over 8.2 MegaWatt of installed solar plants on our rooftops as well as in open access across India. Overall, solar is now serving over 75% of our power requirement and this move has given us immense benefits. Over 90% of the power in our Bahadurgarh unit is now from our Solar plants and we wish to replicate this in our other units as well. Power costs have come down drastically and we are offsetting massive amounts of carbon from the environment. Sunsure has been the instrumental partner in this journey over the last 2 years,” said Lohia, Chairman of the Merino Group of Companies. Shashank Sharma, Founder & CEO of Sunsure Energy stated, “Merino Group is a true leader in harnessing Rooftop Solar power and they are now leading the Open Access movement in the State. It has been our privilege to architect this journey and hopefully Merino will soon be running on 100% Solar Energy.